As a Volvo owner, it is important to find auto repair services that are tailored to your particular vehicle brand. Our ASE certified technicians have extensive experience working with all model Volvos, new and old. We provide a wide range of Volvo services in Greenwood, from factory scheduled maintenance and minor repairs, to transmission service, major engine work, and much more. As a NAPA® authorized auto care center that uses all NAPA and OEM auto parts, you can trust your Volvo is receiving high-quality work from qualified professionals. Our ultimate goal is to get your Volvo S90 or Volvo V70 back on the road safely, and at a fair price. We are a family owned and operated company that is dedicated to work ethic and integrity, which is why we provide first-class auto service at economy-based prices. Compared to the dealerships’ costs, you can get superior Volvo repair and service at a fraction of the price. We also offer 10% discounts for all new customers! 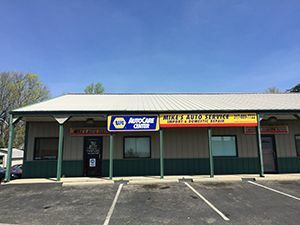 When you call Mike’s Auto Service, you can expect a friendly staff, honest estimates, and quality service. Our clients are treated with the highest regard, and complete customer satisfaction is very important to us. Call our office today at 317-889-7722 for an estimate, or to schedule an appointment.